On Friday, the obstacle racing world received news that Tough Mudder had added a timed heat to their event day offering. Mud Run Guide reached out to Tough Mudder HQ to find out more information regarding the email that many participants received. Thew new timed heat called Tougher Mudder is the latest addition to the Tough Mudder line-up for 2017. With this announcement a few questions were brought up by the Tough Mudder Community. Mud Run Guide has worked with Tough Mudder HQ to help answer some of the questions and concerns that came about after the announcement. Tougher Mudder is a competitive event format taking place during the same weekend as select Tough Mudder and Tough Mudder Half events, ran prior to the first start wave at those events. Tougher Mudder will include course time tracking, prize money for the top 3 positions, and exclusive course challenges. At this time, Tougher Mudder will be taking place on Saturday morning only. It will be timed through a chip or bib tracking system onsite. Where is Tougher Mudder taking place? 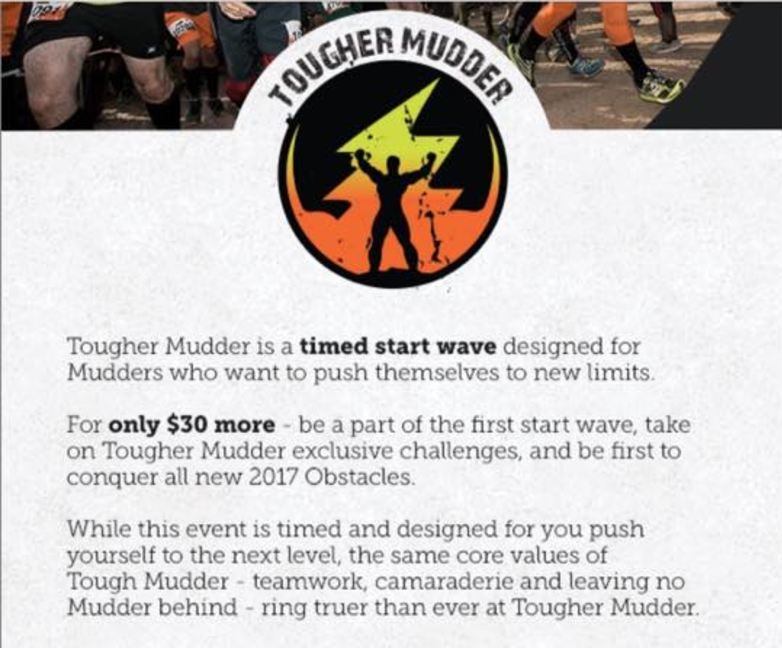 Tough Mudder HQ indicated that they may add additional Tougher Mudder start waves at events throughout North America and internationally. For those who have already signed up for a Tough Mudder at one of these locations but wants to change to Tougher Mudder, add-on tickets will be available on Eventbrite (via the event page). Purchase an add-on and bring both tickets to check-in on event day. What time do I need to be on-site for Tougher Mudder? Tougher Mudder will take place prior to the first standard Tough Mudder start wave of the day. Closer to the event you've registered for, check your email and online for pre-event communications for details on the exact start time for each event. Tough Mudder recommends arriving one hour prior to the Tougher Mudder start. At this time, you must register for Tougher Mudder before coming to the site, and day-of ticket sales on-site will not be available. Spaces in each Tougher Mudder wave will be limited. Tougher Mudder has no competitive team categories, but as always, Tougher Mudder participants are highly encouraged to run with friends, family, and fellow Mudders as a friendly competition. All runners are expected to uphold Tough Mudder values during the race – including helping their fellow Mudders to complete the course and practicing good sportsmanship. 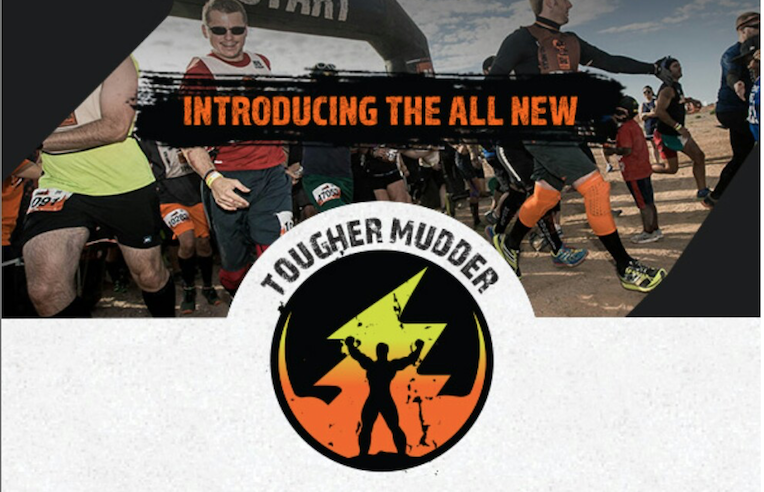 All Tougher Mudder participants will receive an exclusive Tougher Mudder t-shirt, Tough Mudder headband, and discounts to Toughest Mudder events. Top three individual men and women will receive prize money. Will Tougher Mudder have different course and obstacles from a regular Tough Mudder event? Tougher Mudder will be part of the existing Tough Mudder course and obstacles, but will include an additional set of course challenges, specifically created for Tougher Mudder participants. With the addition of the Tougher Mudder heat that now sets up a path to World's Toughest Mudder beginning with Tough Mudder Half, Tough Mudder (the original untimed format), Tougher Mudder (timed format), Toughest Mudder (8-hour night race), and finally World's Toughest Mudder (24-hour obstacle race). Tough Mudder now has an event for everyone in the obstacle racing community. This is what a lot of people have been asking for from Tough Mudder. Should be interesting in how they handle obstacle completion. Will it be mandatory obstacle completion or just an attempt? Will there be penalties for not completing an obstacle? Still lots of details for them to work out. It’s good that they are making an effort to keep this separate from Tough Mudder and Tough Mudder Half events. Definitely interested, I’m just curious how the obstacles designed to be impossible for one person by themselves will be handled. What’d also be awesome if there was a team competition format that included the normal team obstacles where everybody’s time is the time of the last finisher. I hope they consider adding something like that.